You may find Drum or Airlie Castles, Gilnockie Tower or the site of the Battle of Harlaw on maps, but these are not the real places. 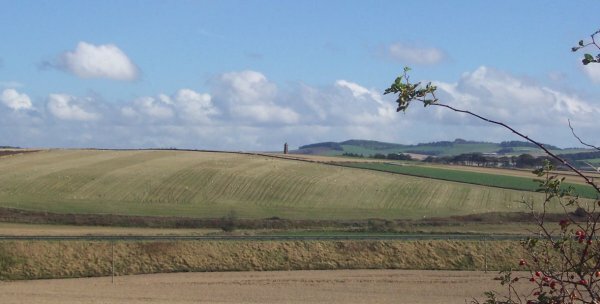 The battle of Harlaw, however was indeed a very real event which was fought on a very real plateau, some fifteen miles north-east of a terrified city of Aberdeen, on a memorable day in the summer of 1411, between recorded combatants whose descendants and castles are with us to this day. Stanley's ballad, unfortunately, was an eighteenth century fake, celebrating heroes who weren't actually at the battle - but more of that later. The event was described in some detail by mediaeval chroniclers; their Latin accounts agree that it was 'atrocious'. In 1411, the last unfilled earldom in Scotland - of Ross - fell to a young girl, rumoured to be crippled and fit only for a nunnery. Unfortunately young Euphemia had been made the ward of the Governor of Scotland, the Duke of Albany, who set about persuading her to give the earldom to one of his sons. Her aunt, however, not only had a valid claim to the earldom, but also was married to Donald, Lord of the Isles, the most powerful magnate in Scotland, able to raise forces of many thousand battle-hardened warriors, both from his scattered Island kingdom and from Ireland. Donald now claimed the earldom from Albany, who bluntly refused. Donald summoned a great fleet to transport some ten thousand men, invaded the mainland, and occupied the county of Ross and its principal castle. The enthusiastic reception he received influenced him to attempt to occupy the outlying lands of the earldom which lay across the North and North-east of Scotland, further south than Aberdeen even. He ravaged his way over and down through the country, halting his ten thousand strong army on the plateau of Harlaw above the little town of Inverurie; sacking the wealthy international port of Aberdeen was said to be in his sights. Unknown to Donald, Duke Albany had asked the Earl of Mar to raise an army for the government, headed by nobles and knights from as far down as the Tay; it had assembled below, in Inverurie, and attacked with the dawn. Donald's men poured out 'like bees from a byke [hive]' and a fearful, bloody slogging match began. It was to last throughout that day until only night separated the combatants. 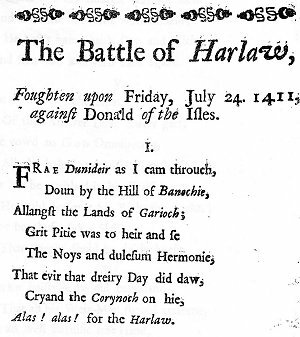 Overnight, Donald, having demonstrated that he could shatter any army brought against him, began a return to the Isles under cover of darkness, leaving over 3000 dead, dying and wounded on the bloody fields of Harlaw. As noted earlier, the chroniclers stated firmly that not only was it a hideously atrocious affair, fought to the death, but also that neither side had victory. One reality, however, was that Aberdeen had been spared, and five hundred years later the citizens raised a Monument to the dead, especially their then Provost Davidson and the three dozen Aberdeen burghers who had volunteered to fight in Mar's army. It stands starkly amongst rich farmland, (very far from 'barren'), which is still farmed to this day by the Maitlands of nearby Balhaggardy, whose ancestor 'had left the plough to join the battle' over six hundred years before. 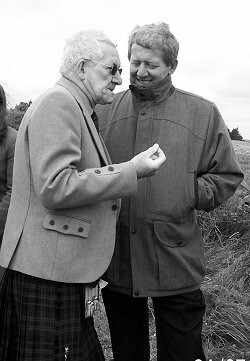 At the 600th anniversary ceremony at the Monument in July 2011, the current farmer, Robert Maitland, was joined by descendants of those who had fought on either side, brave men who had been celebrated in a ballad which had written at the time, The Battle of Harlaw. It was a ballad previously dismissed by Child and others as a 'literary' concoction, for it only first appeared when printed by Alan Ramsay in 1724. Nevertheless it has now been shown linguistically to be authentic, composed around the time of the battle, and with at least one good tune. 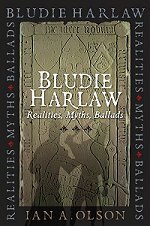 But later there was also to appear another ballad named The Battle of Harlaw, categorised by Child as his number 163, and considered by him and many others to be authentic, a true folksong from the time of the battle. This is the ballad that was sung by Stanley Robertson to Mike Yates. Unfortunately, it can be shown to be a late eighteenth century fake, a concoction which celebrates two heroes of the Forbes family - who were not recorded as being at the battle. It makes no mention of any of those who fought for the Earl of Mar who had been detailed in the 'Ramsay' ballad; it even has a Lord Forbes killing Donald (who was to die in his bed in his castle some twelve years later). After supporting the wrong side in the 1745-6 Jacobite rebellion, the precarious situation of the Forbes family in the north-east had been in considerable need of such a propaganda boost. 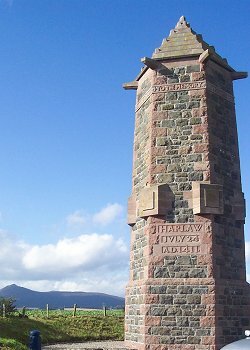 As we walked around the ancient site he began to sing of the battle (The Battle of Harlaw, Child 163). The battle may have occurred several hundred years ago, but it seemed to me, that, for Stanley, it was an event that still lived within his memory and he sang of something that was still very real to him. You may find Drum or Airlie Castles, Gilnockie Tower or the site of the Battle of Harlaw on maps, but these are not the real places. Instead, for these we must look within the heart, rather than the head, to find that which we seek.